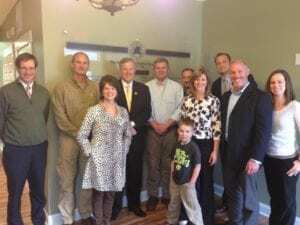 This past Tuesday, at the Asheville HBA office, Sean Sullivan (President of Living Stone Construction and President-Elect for the NCHBA), Steven Webb (lobbyist for NCHBA), Caroline Sutton (Executive Officer of Asheville HBA), and 7 others met with Congressman Mark Meadows to examine current and future problems the country faces in the building industry. One of the main topics that came up during discussions was the type of role the government should play in the housing market. While the Senate is currently engaged in bipartisan efforts to preserve the federal support necessary for proper functioning of the U.S. housing market, the House of Representatives is considering legislation to completely remove the government’s role in this market entirely. The reason for this is because Government Sponsored Enterprises (GSEs), Fannie Mae, Freddie Mac, and the Federal Home Loan Banks (FHLBanks), make it extremely difficult for qualified buyers to receive the loans they deserve; especially during an economic downturn. Sullivan explained that the NCHBA and the NAHB support steps to increase the role of private capital in the U.S. housing finance system, but do not believe the market can rely solely on private sources. When asked what he would suggest, Sullivan replied, “What we need is more of a balance. We need to figure out a system where Fannie Mae and Freddie Mac would be gradually phased into a private-sector oriented system, where the federal government’s role is clear, but its exposure is limited.